Prior to becoming a US territory, Hawaiʻi’s modern army consisted of a royal household guard and militia units. By the 1860s, the Hawaiian military had been reduced to the Royal Guard, a unit assigned to guard the sovereign. They were also known as the Household Guard, Household Troops, Queen’s Guard, King’s Own and Queen’s Own – they guarded the king and queen and the treasury and participated in state occasions. The Guard was an elite group of 60-men from which the King’s body guards were drawn, with a heritage which extended far back into Hawaiʻi’s history. In 1873, King Lunalilo became ill and was convalescing and regaining temporarily part of his lost strength at Waikīkī. At that time, the Guards mutinied – not against the King, but rather, unanimously against their drill master Captain Joseph Jajczay, a Hungarian. Shortly after, at the request of the king, a delegation of three of the mutineers went out to see him at Waikīkī; he told them they must submit to orders and trust to his clemency. The mutineers obeyed his order to stack arms, but they stayed in the barracks, instead of going to their homes as they were expected to do. While some reports suggest the mutiny was triggered because the drill-master was very strict and planned to punish some of the men for a breach of duty, other reports suggest otherwise. After further negotiation, the mutineers obeyed the king’s order. Lunalilo then issued a decree disbanding the Household Troops and the kingdom was thus left without any regular organized military force. 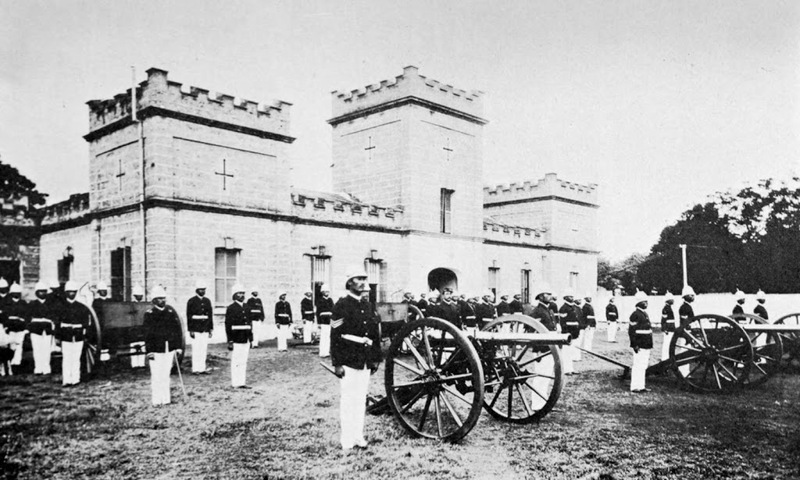 In 1893, the Provisional government disbanded the guards and used the Barracks for munitions storage. It is unclear how many soldiers made up the Hawaiian army. Some suggest the 60 Household Guards was the total strength. The memory and legacy of the Royal Guard lives on through two venues. In 1916, the US Army’s 32nd Regiment was first organized on Oʻahu. At its activation, it was known as “The Queen’s Own” Regiment, a title bestowed by the last queen of Hawaiʻi, Liliʻuokalani. In addition, the Royal Guard of the Hawaiʻi National Guard is an Air National Guard ceremonial unit which re-enacts the royal bodyguards of the Kingdom of Hawaiʻi. The unit, created in 1962, is made up of Hawaiian resident Hawaii Air National Guardsmen, who are either full Hawaiian or part-Hawaiian ancestry. The current unit is ceremonial unit only and serves the Governor for official State functions and other public functions. The unit is structured in the same way as the original organization. The governing body, or “Na Koa Hoomalu Kini O Ka Moi” (King’s Body Guards), is composed of five men elected by the general membership. The five men, in turn, select the “Kapena Moku” (Commander of Troops). The image shows the Royal Guard outside their barracks. In addition, I have posted other images in a folder of like name in the Photos section on my Facebook and Google+ pages.